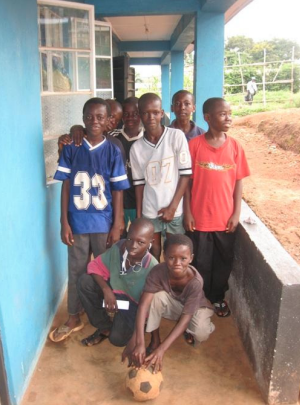 Freetown, SIERRA LEONE, August 22, 2008 – Miracle Corners Sierra Leone (MCSL) launched a new wave of youth programs at the Mwakawago Youth Resource Center in Freetown in August. Designed by a team of local volunteers and MCW fellow Amanda Blount, the new programs offer innovative health, safety and educational opportunities for young people living in the poorest part of the capital city. Sierra Leone, which is recovering from a ten-year long civil war, is the lowest ranked country on the United Nations Human Development index. Much of the West African country’s infrastructure, such as water systems, power grids, roads, schools and businesses, was destroyed during the war. Unemployment, illiteracy and disease, coupled with corruption and poverty, are current challenges facing the population and the democratically elected government. Since 2005, MCSL has worked closely with the community in Kissy to address the needs of the community and to find ways to alleviate some of the strain in the eastern part of the city, which was hit the hardest during the war. Working with volunteers from the Kissy community, an MCSL Leadership Team conducted a two-month needs assessment and prepared a programming development plan. The program was launched with a new Youth Fitness and Athletics program. “This new program seeks to provide a fun, safe and healthy environment where young Sierra Leoneans can learn skills and enjoy each other’s company,” said Ishmeal Kamara, MCSL Leadership Team member. Kamara and another team member named Charlie Kamara designed the new health and well-being program. The program was launched with yoga and karate classes, with more than fifty youth registering for the program on opening day. “Several youth from Kissy were so enthused about the program that they offered to volunteer their time to help us complete the registration process,” said Harry Gbetuwa, MCSL Leadership Team member. Gbetuwa is currently organizing a nutritional awareness program, which aims to help combat malnutrition and vitamin deficiency among the youth, who lack knowledge about healthy eating habits, in the center’s cafeteria. In September, MCSL will offer a peer-mentoring and tutoring program for elementary and high school students beginning in early September. Peer tutors from the Leadership Team, alongside community volunteers, will facilitate the program three times a week. “We hope to reach a large population of youth who suffer from over crowded schools and inaccessibility to support and tutoring from their school teachers,” said Philip Bangura, MCSL volunteer. In October, MCSL plans to launch additional programs, beginning with a cultural dance and drama program for women, who lack educational and economic opportunities and access. Plans are also underway to develop a “football” [soccer] league, followed by a basketball league.